Looking for a research grant? Better Financial Security in Old-Age? David John, Deputy Director of the Retirement Security Project and senior advisor at the AARP Public Policy Institute, is one of the featured speakers at the event described below. Longevity annuities-a financial innovation that provides protection against outliving your money late in life-have the potential to reshape the retirement security landscape. Typically bought at retirement, a longevity annuity offers a guaranteed stream of income beginning in ten or 20 years at a markedly lower cost than a conventional annuity that begins paying out immediately. Sales have grown rapidly and it will be even easier to purchase the annuities in the future given new Treasury regulations. While economists have touted the attractiveness of longevity annuities as a way to ensure the ability to maintain one's living standards late in life, significant barriers to a robust market remain-including lack of consumer awareness, questions about product value, and employer concerns with taking on fiduciary responsibility by offering these products to their employees. Can longevity annuities overcome these barriers to find widespread popularity among Americans retirees? On November 6, the Retirement Security Project will host a panel of experts to discuss the potential for these products to contribute to the economic security of older Americans. Speakers include William Gale, David John, Henry J. Aaron, David Wessel, Benjamin Harris, Mark Iwry and more. In 2013, the Social Security Disability Insurance (SSDI) program spent $143 billion while taking in just $111 billion. 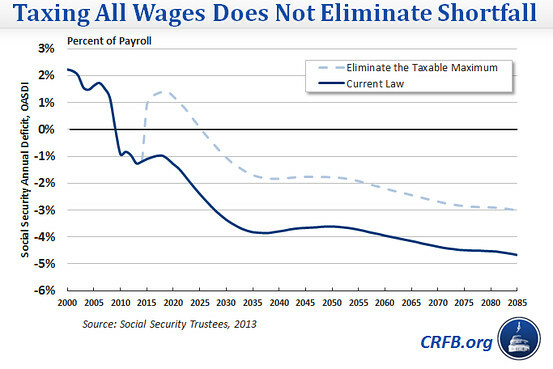 That shortfall, explains Jagadeesh Gokhale, economist for the Cato Institute, will only continue, and the SSDI Trust Fund is projected to run out of money entirely in 2016. In addition to being insolvent, Gokhale explains that the SSDI program -- intended to provide a safety net for individuals unable to work -- is full of work disincentives. Many individuals enrolled in the program are actually able to work, at least to some degree, but they choose not to for fear of losing SSDI benefits. A study comparing identical SSDI applicants -- some of whom were admitted to the program while the rest were rejected from the program -- found that many rejected applicants returned to the work force, indicating that over 25 percent of current SSDI beneficiaries actually have work capacity. Another study found the likelihood of a rejected SSDI applicant returning to work to be 35 percent. Use a "benefit offset" that would reduce an enrollee's SSDI benefits if he enters the workforce but would provide an additional subsidy -- from a non-SSDI source -- based on his earnings. That subsidy would increase as his earnings increase, in order to encourage, rather than discourage, additional work. In short, Gokhale describes his plan as one that would pay capable individuals to work rather than pay them to remain idle. While there are many SSDI enrollees who appear to have some level of work capability, they choose not to enter the labor force. By creating an incentive structure that only improves with work activity, Gokhale suggests more SSDI beneficiaries would return to work and seek employment. Source: Jagadeesh Gokhale, "SSDI Reform: Promoting Gainful Employment while Preserving Economic Security," Cato Institute, October 22, 2014. This paper investigates whether exchanging the Social Security delayed retirement credit (currently paid as an increase in lifetime annuity benefits) for a lump sum would induce later claiming and additional work. We show that people would voluntarily claim about half a year later if the lump sum were paid for claiming any time after the Early Retirement Age, and about two-thirds of a year later if the lump sum were paid only for those claiming after their Full Retirement Age. Overall, people will work one-third to one-half of the additional months, compared to the status quo. Those who would currently claim at the youngest ages are likely to be most responsive to the offer of a lump sum benefit. A hypothetical solution that would have closed the shortfall last year now only closes about 95 percent of the shortfall. Previously, a 2.9 percentage point tax increase (raising the combined payroll tax from 12.4% to 15.3%) would be enough to solve the shortfall. Now, that increase would need to be 3.1 percent. Similarly, a 17.5 percent reduction in all benefits would have addressed the shortfall last year, but it would need to be 18.4 percent this year. Furthermore, these options assume the changes are made immediately. Waiting 20 years requires changes to be 50 percent larger. Check out their full blog here. "The Retention Effects of High Years of Service Cliff-Vesting Pension Plans"
We study the retention effects of the Australian military’s decision to remove a 20-year cliff-vesting requirement from their retirement system in 1991. We follow to the present individuals who self-selected into and out of the 20-year cliff-vesting plan, as well as those who were forced out of the plan. Eliminating the high years of service cliff-vesting provision leads to consistently higher attrition over time. "Early Retirement Across Europe. Does Non-Standard Employment Increase Participation of Older Workers?" In many European countries, the labor market participation of older workers is considerably lower than the labor market participation of prime-age workers. This study analyzes the variation in labor market withdrawal of older workers across 13 European countries over the period 1995-2008. We seek to contribute to existing macro-econometric studies by taking non-standard employment into account, by relating the empirical model more explicitly to optional value model theory on retirement decisions and by using a two-step IV-GMM estimator to deal with endogeneity issues. The analysis leads to the conclusion that part-time employment is negatively related to labor market withdrawal of older men. This relationship is less strong among women. Additionally, we find that part-time employment at older ages does not decrease the average actual hours worked. Furthermore, the results show a positive relationship between unemployment among older workers and early retirement similar to previous studies. The Associated Press reports on the Cost of Living Adjustment Social Security beneficiaries are likely to receive in January. The COLA will be announced this Wednesday, but the AP estimates an increase of less than 2 percent, which amounts to about $20 per month for the typical beneficiary. Read more here. This paper uses data from the Health and Retirement Study to examine the effects of the Great Recession on the wealth held by the near retirement age population from 2006 to 2012. For the Early Boomer cohort (ages 51 to 56 in 2004), real wealth in 2012 remained 3.6 percent below its 2006 value. This is a modest decline considering the fall in asset values during the Great Recession. Much of the decline in wealth over the 2006 to 2010 period was cushioned by wealth originating from Social Security and defined benefit pensions. For the most part, these are stable sums that ensured a major fraction of total wealth did not decline as a result of the recession. The rebound in asset values observed between 2010 and 2012 mitigated, but did not erase, the asset losses experienced in the first years of the Great Recession. Effects of the Great Recession varied with the household’s initial wealth. Those who were in the highest wealth deciles typically had a larger share of their assets subject to the influence of declining markets, and were hurt most severely. Unlike those falling in lower wealth deciles, they have yet to regain all the wealth they lost during the recession. Recovering losses in assets is only part of the story. The assets held by members of the cohort nearing retirement at the onset of the recession would normally have grown over ensuing years. Members of older HRS cohorts accumulated assets rapidly in the years just before retirement. Those on the cusp of retiring at the onset of the recession would be much better off had they had enjoyed similar growth in assets as experienced by members of older cohorts. The bottom line is that the losses in assets imposed by the Great Recession were relatively modest. The recovery has helped. But much of the remaining penalty due to the Great Recession is in the failure of assets to grow beyond their initial levels. With lawmakers considering future changes to Social Security, it’s important to know what their constituents want — across political parties, generations, and income levels. Join the National Academy of Social Insurance for the release of a groundbreaking new public opinion study. 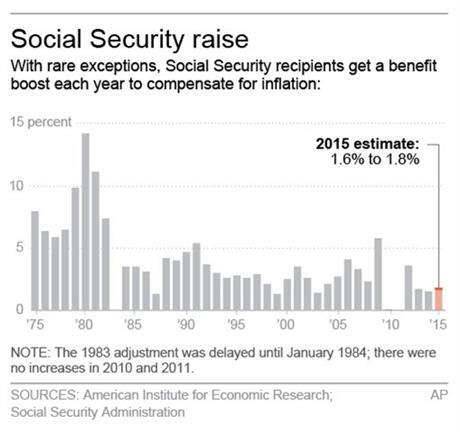 Social Security faces a long-term funding challenge. How do Americans want to deal with it? This survey explores Americans’ views on Social Security and uses an innovative application of trade-off analysis, a technique widely used in market research, to explore the kinds of policy changes that Americans want for Social Security and are willing to pay for. If voters could choose their own policy package, what would it look like? Survey participants chose among policy options that would reduce benefits, increase benefits, or raise revenues to put the program on solid footing for future generations. Speakers will present findings from the Academy’s new report — Americans Make Hard Choices on Social Security: A Survey With Trade-Off Analysis — and discuss the implications for policymakers. Social Security has played a big role in the Iowa Senate race between Republican Joni Ernst and Democrat Bruce Braley. FactCheck.org weighs in on some of the claims. Check it out here. "How Does Household Expenditure Change With Age for Older Americans?" Retirement saving involves a lot of unknowns, the most important being not knowing how much money will be needed in retirement. Although it is impossible to predict the retirement expenses of any particular household, the average amounts spent by current retirees can serve as important benchmarks for individual savers as well as for industry experts and policymakers. This paper examines the expenditure pattern of the older segment of the U.S. population. The majority of the households studied here have either reached retirement age or are on the cusp of retirement. The data come from the Health and Retirement Study (HRS) and the Consumption and Activities Mail Survey (CAMS), which is a supplement of the HRS. CAMS contains detailed spending information on 26 nondurable and six durable categories, and it follows the same group of people over time. Using this information coupled with the income information available in the HRS, this study summarizes the consumption behavior of the American elderly. The primary goal is to examine how overall spending and spending in different categories change with age. Home and home-related expenses is the largest spending category for every age group. Health expenses increase steadily with age. In 2011, households with at least one member between ages 50 and 64 spent 8 percent of their total budget on health items, compared with 19 percent for those age 85 or over. Health-related expenses occupy the second-largest share of total expenditure for those ages 75 or older. The two components of household expenditures that show a declining pattern across age groups are transportation expenses and entertainment expenses. Food and clothing expenses (as a share of total expenditure) remain more or less flat across the different age groups. There is a large increase in spending at the 95th percentile for those ages 90 or older, which can be attributed to very high health care expenses. "Initial Performance of Pension Privatization in Eastern Europe – Are Reform Reversals Justified?" During first 15 years of their existence, mandatory private pension funds in Eastern Europe have realized rates of return that were lower and more volatile than the corresponding Pay-As-You-Go rates of return, even before the emergence of global financial crisis. Suboptimal investments in domestic government bonds dominated pension portfolios in many countries. Econometric analysis suggests that pension privatization failed to produce anticipated side-effect benefits, such as increased national saving or accelerated economic growth. If pension privatization structural weaknesses are unlikely to be resolved successfully then implementing reform reversals could improve short-term fiscal balance without deteriorating long-term pension sustainability. Writing in the Wall Street Journal, the Committee for a Responsible Federal Budget’s Maya MacGuinea argues that raising the Social Security payroll tax ceiling, while perhaps justifiable, won’t fix the problem so much as delay it. The McCrery-Pomeroy SSDI Solutions Initiative is now accepting proposals for papers presenting innovative ideas to improve the Social Security Disability Insurance (SSDI) system. The SSDI Solutions Initiative is a project co-chaired by former Congressmen Jim McCrery (R-LA) and Earl Pomeroy (D-ND) dedicated to identifying practical and realistic policy changes to improve the SSDI program for its beneficiaries, those contributing to the program, the economy, and society as a whole. The Social Security Disability Insurance (SSDI) Solutions Initiative is soliciting ideas to improve various aspects of the SSDI program. Proposals are due by November 1, 2014; selected papers will be presented at a conference in Washington, D.C., in mid-2015 and included in a consolidated volume to be disseminated widely and shared with policymakers and experts in advance of the SSDI trust fund's projected 2016 insolvency date. Potential authors may submit a notice of intent to apply, along with any questions, to info@ssdisolutions.org. Click here to read a detailed description of suggested paper topics, learn how to submit a proposal, and download a submission form. Abstract: This paper examines the distributional implications of introducing additional means testing of Social Security benefits where proceeds are used to help balance Social Security's finances. Benefits of the top quarter of households ranked according to the relevant measure of means are reduced using a modified version of the Social Security Windfall Elimination Provision (WEP). The replacement rate in the first bracket of the benefit formula, determining the Primary Insurance Amount (PIA), would be reduced from 90 percent to 40 percent of Average Indexed Monthly Earnings (AIME). Four measures of means are considered: total wealth; an annualized measure of AIME; the wealth value of pensions; and a measure of average indexed lifetime W2 earnings. The empirical analysis is based on data from the Health and Retirement Study. These means tests would reduce total lifetime household benefits by 7 to 9 percentage points. We find that the basis for means testing Social Security makes a substantial difference as to which households have their benefits reduced, and that different means tests may have different effects on the benefits of families in similar circumstance. We also find that the measure of means used to evaluate the effects of a means test makes a considerable difference as to how one would view the effects of the means test on the distribution of benefits. Abstract: We introduce a tractable model of post-retirement saving behavior in which households have a precautionary motive arising from uninsured health status risks. The model distinguishes between annuitized and non-annuitized wealth, emphasizes the importance of asset composition in determining optimal household behavior, and includes an extension allowing late-in-life exchange transactions among relatives. We consider three puzzles in micro data - rising cohort average wealth of retirees, lack of demand for market annuities, and the relative scarcity of bequests - and show that our model can provide intuitive explanations for each. Abstract: The degree to which the Social Security tax distorts labor supply depends on the extent to which individuals perceive the link between current earnings and future Social Security benefits. Some Social Security reform plans have been motivated by an assumption that workers fail to perceive this link and that increasing the salience of the link could result in significant efficiency gains. To measure the perceived linkage between labor supply and Social Security benefits, we administered a survey to a representative sample of Americans aged 50-70. We find that the majority of respondents believe that their Social Security benefits increase with labor supply. Indeed, respondents generally report a link between labor supply and future benefits that is somewhat greater than the actual incentive. We also surveyed people about their understanding of various other provisions in the Social Security benefit rules. We find that some of these provisions (e.g., effects of delayed benefit claiming and rules on widow benefits) are relatively well understood while others (e.g., rules on spousal benefits, provisions on which years of earnings are taken into account) are less well understood. In addition, our survey incorporated a framing experiment, which shows that how the incentives for delayed claiming are presented has an impact on hypothetical claiming decisions. In particular, the traditional "break-even" framing used by the Social Security Administration leads to earlier claiming than other presentations do.